Premium-quality micrograin solid carbide bit is precision ground for an extra-fine finish with maximum sharpness and edge retention. 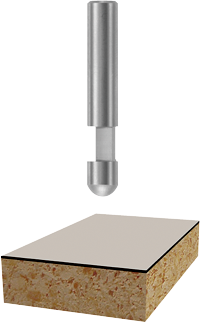 Flush trim bits are used for laminate work or for template and pattern work. For template application, the bearing follows the template, while the cutting edges trim the work piece.Single flute trim bit allows for a faster feed rate. Solid carbide gives best rigidity and long life.